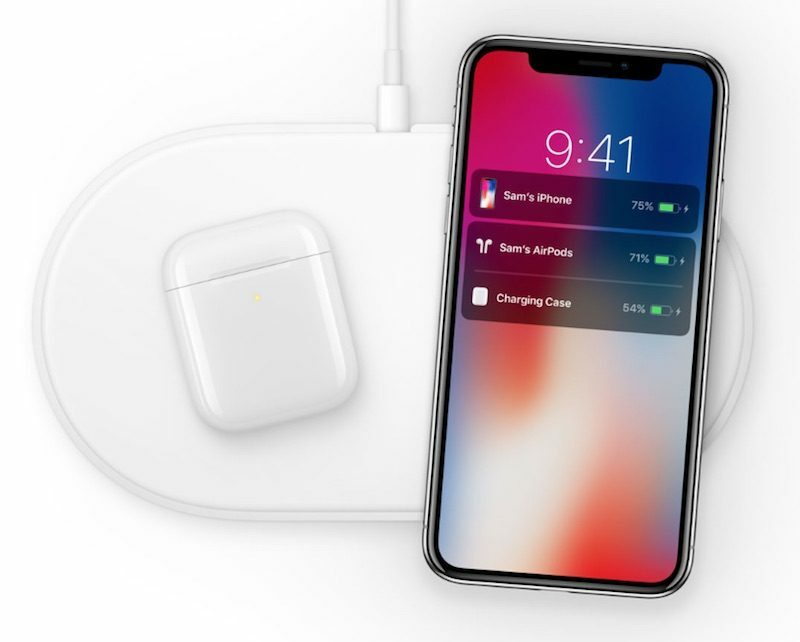 Apple's long-awaited AirPower could be launching in the near future, based on coding changes that 9to5Mac's Guilherme Rambo says he found in the latest iOS 12.2 beta, released yesterday morning. There have been "significant changes" to the wireless charging code in the beta update, including "code responsible for identifying that two devices are charging on the same mat," which could indicate that Apple is planning an AirPower launch soon. Apple's AirPower charging mat will be able to charge an iPhone, Apple Watch, and AirPods (with a new wireless charging case) all at once. The AirPower charging mat was first announced in 2017 alongside the iPhone X, but has seen production difficulties that led to multiple delays. In the iOS 12.2 beta specifically, there are changes to the 3D animations that are displayed on the largest of the charging devices to let you know charging levels. Apple has been silent on the AirPower ever since announcing it, but there have been continual signs that the Cupertino company is still working on it, including multiple recent rumors that a launch is happening in the spring. Apple on Monday introduced a new iPad Air and an iPad mini 5, and today introduced refreshed iMacs, suggesting it is perhaps aiming to roll out all of its spring hardware updates ahead of its services-focused event on March 25. Ahead of when the iPads and iMacs launched, we heard from a source that suggested Apple would debut new products on Monday through Wednesday, with a new iPod touch set to be announced tomorrow. We haven't heard word of an AirPower launch or an AirPods launch with new wireless charging case, but that doesn't mean it's not going to happen. There's a chance we will see AirPower and AirPods this week, but if not, it certainly seems like we're at least a bit closer to a debut. Is it one of the most delayed Apple products? Pretty much, although we have been waiting on a half-decent Mac Pro since December 2013. 18 months to launch a product they hyped at a keynote. I'm beginning to think there is nothing that cannot be predicted by looking at iOS code. It'll probably be bargain priced at $199.95. It would be a huge mistake to not launch the AirPower mat alongside the second generation AirPods. If I had a dime for every time this site said "suggests" when it came to possible new Apple gear, and it never panned out, I'd be able to buy this site. I don't see the value in such a product. As I’ve seen this comment so much, for some I guess there isn’t a value. However, for me, I travel multiple times per month. Just this last weekend I was away from Friday to Sunday. I had to unplug my iPhone wireless charger, my Apple Watch charger and my AirPods charger. I utilize them to the point where I need to charge them at least every other day. Then in the hotel I have to spread the chargers out for different outlets and I understand that it’s not the end of the world but having one charger now for all three products will just save that extra hassle every time I have to travel. So I hope Apple continues to see the value in this product, a product I’ve been anticipating since 2017. So it won't be able to charge AirPods, Apple Watch & iPhone at once? That's a shame. Apple's AirPower charging mat will be able to charge an iPhone, Apple Watch, and AirPods (with a new wireless charging case) all at once. You don’t? I guess you don’t have an iPhone, Apple Watch and AirPod. I do and my girlfriend does as well. 6 cables and chargers. That’s excluding our iPads and MacBook pros, plus the extra charging cables in the living room when we need to charge in there. So even if you can’t see the value, there are people like me who are on edge waiting for the release of AirPower. It has tremendous value in its ease of use and convenience. I’d pay up to $150 for one of these and I want 3, 2 for the bed room and one for the living room. Not to mention how easy packing chargers when traveling will become. The only thing that seems special about your use case is the tortured description of what you go through for travel. Pretty sure every traveler has a pouch/compartment/bag for chargers. AP won't change that. It may reduce the number of power bricks you carry, but it would increase the surface area of the charger you'd carry. AP is not a small device. I'd bet it's no smaller than the smart surge protector I carry in the bottom of my travel backpack. I understand you're trying to make a point. But it's always funny when people try to make a point by turning pedestrian activities into Sisyphean tasks. You like AP. That's totally fine. You don't have to make charging a "maddening" prospect to justify liking it. If charging really is maddening, you should really look into a smart surge with usb. Get's rid of most power bricks... or just wait on AP to see if it solves your issues. Lmao your comment. It’s simple, we want a single charger that can charge all our devices, set down and forget it. When I get home from work, I set my watch down, my phone and my AirPods in the same place on a single surface, done, finished. No need to physically plug in my phone and AirPod, and set the watch on a separate surface. It’s simple and convenient, we like simplicity and convenience, and what you propose is quite the opposite. There is a want and demand for AirPower. The creators of many of our technological devices use the same devices we use so that puts them in a unique position to understand our wants, needs and frustrations. They’re able to do something about it because they have the required skill set. AirPower will sit nicely on my dresser for my iPhone, AirPod and Apple Watch, it will do the same on the night stand for my girlfriend, it will also be welcomed in my living room on the side table when we need to charge our cellphones or guests cellphones. This is how Charging my 3 devices look like now. If you still don’t see or understand how others see the value, simplicity or convenience in this, then you don’t want to see it.